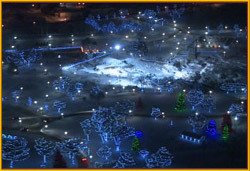 Enjoy a helicopter flight to see the lights of Sioux Falls and Winter Wonderland at Falls Park. Cost is $245.00 for 2, and $280.00 for 3. Includes wines and heavy appetizers, flight, and dessert and wines. Must call for reservations with a credit card to hold it. 605-543-5071. Helicopter flight, heavy appetizers, and wine tastings.